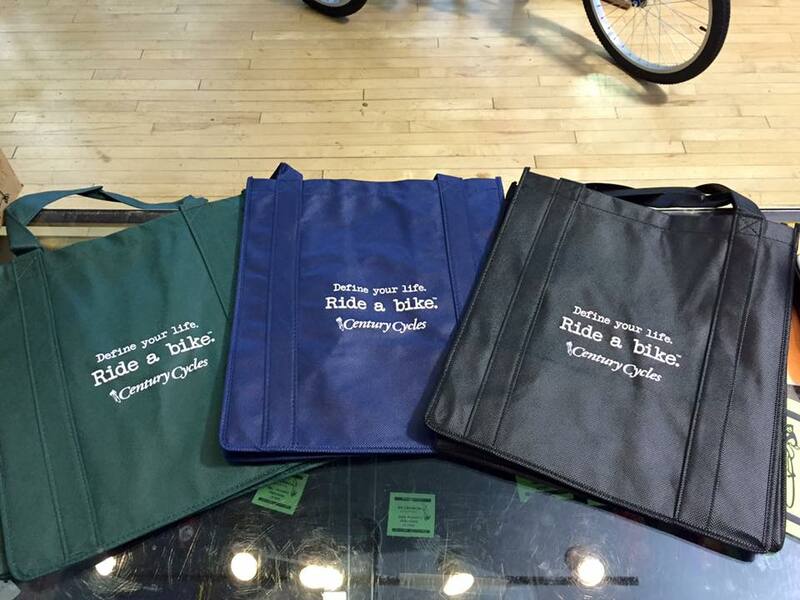 Century Cycles Blog: Our NEW Re-Usable Grocery Bags debut at the On the Edge Film Festival! Our NEW Re-Usable Grocery Bags debut at the On the Edge Film Festival! NEW! Run your errands in style, and help keep more plastic bags out of the environment with our "Define your life. Ride a bike. (tm)" Re-Usable Grocery Bags! Emblazoned with our popular slogan and logo, they're available in three colors as shown (green, blue, and black). We'll debut these TONIGHT (Oct. 9) and tomorrow night (Oct. 10) at the On the Edge Film Festival! Come visit our sponsor table and pick up a bag for $2 each! Also, anyone arriving at the film festival using a "green" method of transportation (walk, bike, public transportation, or car-pooling) receives a $5 CC Bucks coupon, good toward merchandise at any of our three Century Cycles stores! Plus, register to win other prizes, including a free bicycle tune-up! Check out Ray's Indoor Bike Park!